What’s wrong? What’s right? What’s an angle? Got a question about how to behave at the poker table (or a comment about a column)? Email TRG at editor@cardplayer.com. Make playing poker an easy and fun experience for both pros and recreational players. Close loopholes that allow unethical players to gain an advantage over those who choose to be more honest. Promote the play of more hands. It’s obvious that his second guideline can pass without comment (essential, always). His third guideline is more structural, though perhaps we could all play a few more marginal hands, recalling the dictum that to get action you have to give action (and that nothing is more boring than a game with few flops seen). But what interested The Rules Guy in Galfond’s philosophy was the applicability of his first governing principle to behavior at the table. This is TRG’s gloss on it (note: Galfond may differ): Be welcoming, friendly, and enthusiastically collegial to your opponents – particularly if they are inexperienced and new to the game. 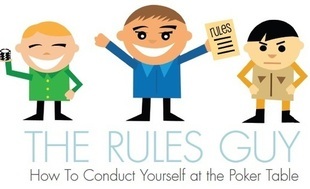 One of the most irksome things to see at the card room is someone rolling their eyes (or much, much worse) when a new player has to be reminded of the protocols or the mechanics of the game. We should help them get used to the arcane world of poker. We should use our demeanor to make them want to return. If poker is a club (and it often resembles one), it’s a club that is actively, continuously seeking new members. Galfond’s tenets feel right in terms of an overall poker philosophy, and his overarching mission – promoting “the good of the game” – is something no one should take for granted these days. Ten or 11 years ago, poker was monumentally huge, on the cusp of breaking out and becoming truly mainstream. But who knows what kind of governmental change will be required to reignite that boom? So it behooves every player to think about how to attract new players and strengthen the poker community. Props to Phil Galfond for showing us the way. You Know What Tilts The Hell Out of Me…? Man, I just hate it when someone doesn’t post their blind. It slows everything down and destroys the rhythm of the game. It tilts the hell out of me. And I’ll tell you another thing that tilts the hell out of me: requesting a deck change. WTF! Can anyone really believe that a new deck is going to make a shred of difference? All that does is slow down the game even more. But here’s my real question and this, really, seriously, tilts the hell out of me: What do you do when someone takes forever to act and you’re sitting there getting the hell tilted out of you? Everything you point out – people who don’t post a blind or ante quickly, who ask for a new deck every half hour, who tank pointlessly – every situation you describe (and The Rules Guy suspects you’ve got a host of others ready and waiting) can be irritating. TRG believes he has made his views on each of these behaviors (and a host of others over several years of writing this column) in clear and forceful ways. Always post your blinds in a timely fashion. Don’t ask for a new set-up because you’re not running well with the current one. Don’t tank unless you are genuinely, positively facing a decision that affects your tournament life or is a legitimately enormous pot. Let TRG go on: Don’t slowroll. Don’t needle. Don’t disrespect the dealer. Don’t throw cards. Etc., etc., etc., etc. These things are all bad, rude, and inimical to the game. Your question prompts a different response, TTHOOM. It takes two to tilt: the dorks who do tilt-y things, and the players who let themselves be tilted by tilt-y dorks. Why do you let these petty annoyances tilt you? That’s on you, TTHOOM. Be like Buddha. Let these trivialities (annoying, yes, absolutely; important, no, absolutely) roll off your back like raindrops off an umbrella. Pay them no more mind than you would a fruit fly hovering over your breakfast table. You have bigger concerns than being tilted by an untutored or boorish player. You are trying to play your A-game. And if you are tilted, you can’t. It’s because of, like, science (shorthand version: the release of cortisol and the fight-or-flight response; when you tilt, your brain is focused on other things). So the answer is not to change everyone’s behavior (as nice as that might sound). The answer is to change your mindset. TRG will admit that philosophical and mindset changes don’t come easily. They aren’t natural to begin with; they certainly aren’t natural to most dopamine-addicted poker players. But you can improve your ability to ignore the tilters. As TRG has gotten older, he has learned that a Zen approach – of letting things go, accepting and acknowledging and then dismissing, hurts and frustrations and losses – is useful in life and absolutely essential in poker. As noted above, you cannot consistently play your A-game if your mind is dwelling on what some irksome player does in a craven bid for attention or a transparent desire to annoy you. The second you get peeved, your mind goes primitive, ready to fight or flee, and decidedly not ready to make rational decisions. Poker is a social battle – it’s you versus a table full of people, each of whom is determined to separate you from your chips. But poker is also an internal battle – it’s you versus yourself. There is a part of yourself, the part that gets tilted to hell, that is much more dangerous to your bankroll.